The Columbus Explorers celebrated manager Joe Weber before, during, and after an 11-0 win over visiting Key West on Tuesday afternoon. 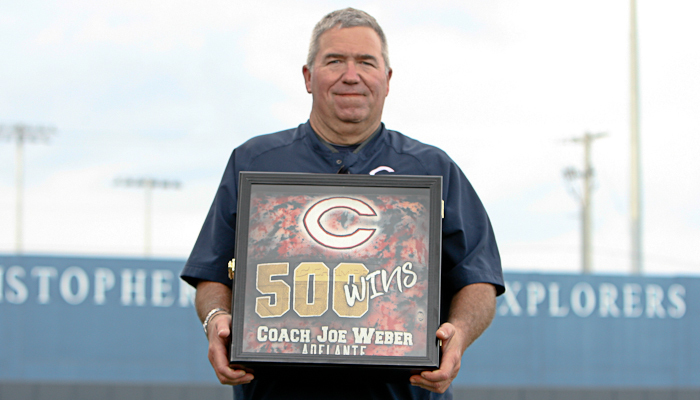 Weber was honored before the game in a ceremony celebrating his recent 500th win as manager at Columbus. The Explorers celebrated on the field, scoring in every inning and shortening the game to six innings by the run-rule when Jonathan Velasquez belted a walk-off three-run homer in the bottom of the sixth inning. Just as dominant as its offense, Explorers pitchers Jonathan Gonzalez and Anthony Vega mowed down Conchs hitter, combining on a one-hit shutout. Jonathan Velasquez rounds the bases on his game-ending three-run homer. Gonzalez threw four perfect innings, striking out three, in honor of his manager. 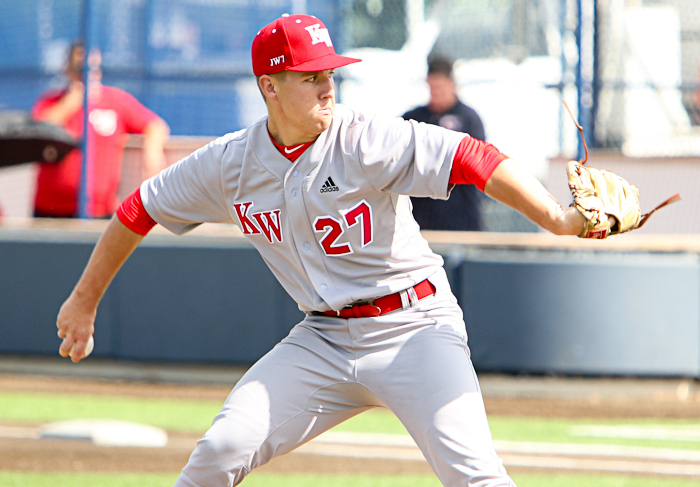 “He’s helped me from my freshman year to now,” said the junior lefty in praise of Weber. “I’ve changed a lot. I’ve improved. Mechanics, my mind, stay mentally focused into the game,” Gonzalez said of the specific areas in which Weber has helped his game. Vega worked the final two innings, striking out two, while giving up a lone single to Key West’s Brendan Roney, who was the only baserunner of the game for the Conchs, who fall to 5-7. “I was throwing a lot of strikes, my off speed was working, curveball, change up,” Gonzalez said of his perfect outing. “It was a good team win. I had a lot of defense helping behind me. 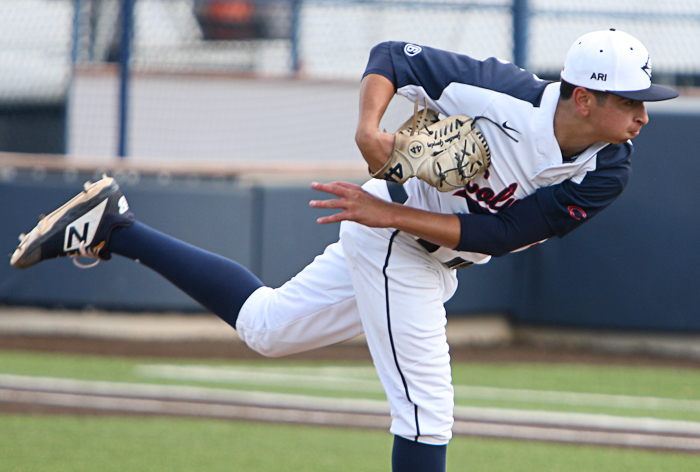 Columbus starter Jonathan Gonzalez threw four perfect innings. 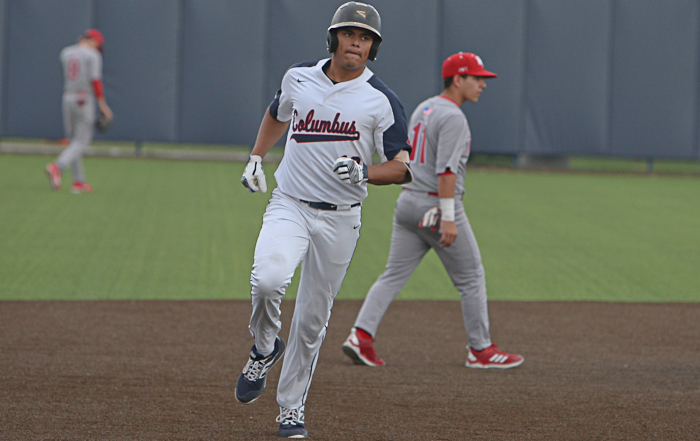 JP Herholtz paid tribute to his manager with a perfect 4-for-4 day at the plate to lead Columbus’ 12-hit attack. The junior first baseman has been on a tear since changing his approach at the plate starting with the Ferguson game early this month. “I started off the year a little so, worked on it and stayed through it and kept grinding, just putting the ball on the bat,” Herholtz said. “Instead of trying to lift everything and trying to hit everything out, just trying to hit line drives, trying to put the ball in play. That’s really helped me out. Key West starting pitcher Callan Carn. Jorge Braceras added two hits and drove in three runs for the Explorers, who extend their win streak to seven games and improve to 9-2 for the season. Alex Rodriguez walked twice, scored twice, stole a base, and also drove in a run.